Tanya DePass is the founder of I Need Diverse Games, a non-profit that advocates for diversity in gaming. 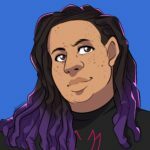 In addition to offering speaking engagements, GDC scholarships, and diversity programming at events such as GaymerX, Tanya has also hosted Fresh Out of Tokens, a weekly interview-based podcast, in which she interviewed such gaming luminaries as Zoë Quinn, David Gaider, and Jim Sterling. After two years and 95 episodes, Fresh Out of Tokens, went off the air in July 2017. In this episode of Polygamer, Tanya and I discuss what got us into diversity podcasting, how we found our guests, and what we’ve loved and hated most about producing our shows. How do we know if our show is “successful”? Has our show made gaming better? Have we learned anything about ourselves? What advice would we give to someone interested in starting their own diversity podcast? How will her upcoming guest appearances on the Spawn On Me podcast be different? All these topics and more are covered in this post-mortem.